It had weighed to continue with it is a background of the scan, but already I saw many wallpapers with the same background and not, I change it. I am not expert at using petals of sakura! Buahh~~~ hope that this good like them was done by me, because I see that they do them since me prove to my, hope that they are so of your pleasure. 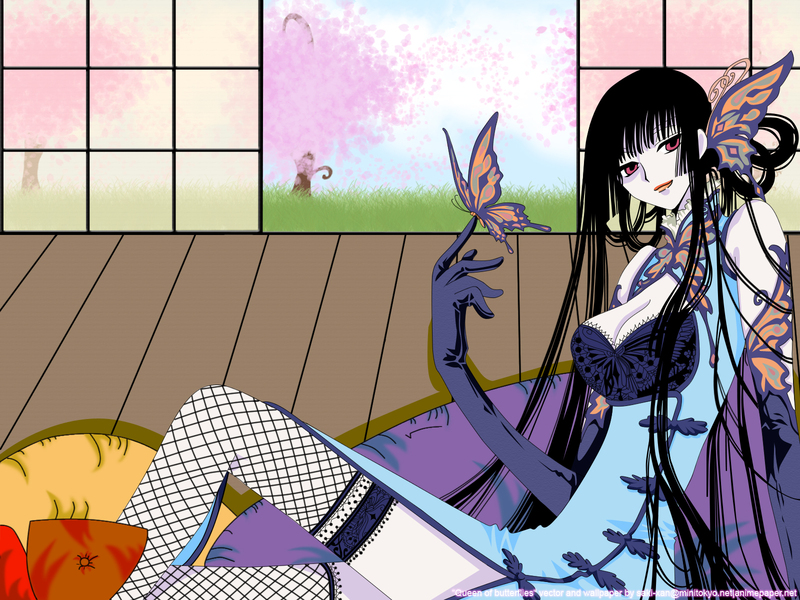 The name am I it for that butterfly that Yuuko has on his hand, also one in hair, not? But I gave the name for this reason, sorry for my short imagination. Hay algunos detalles q hay q afinar como por ejemplo el piso, no se...no parece madera, habria q agregar alguna textura para q se viera mejor. Los arboles tambien necesitan trabajo. Aca te dejo un link con un tutorial para los arboles, http://www.imanimetions.net/main.php?nav=tutorial. Tambien, el pasto, si hubieras usado diferentes tonos de verde, se veria mas profundo. Oh~ I think Sinever is a she, isnt it? ^^"
I don't like how it looks.. and... think about the point of the.. the perspective.. i don't know how to say it... -.- spanish it' s btter... ajajajajja gomen.. I know how hard this scan is to vector since I vectored it too. All in all a very nice wallpaper. *gasp* wow. What a wallie you have created! As said before maybe there's something "missing" from background but even like this it's still very nicely done. I am sorry that I it is not activated in Minitokyo, but I saw if gallery and it is agreeable! Your vector of Yuko is great! I'm not a big fan of the bg, it's a litte too simplistic. Great work on the vector! Such tiny lines! This is a fine art for an art made in just little time !